[Maundy Thursday], however, was in Holy Week, a season of sadness, during which the minds of the faithful are expected to be occupied with thoughts of the Lord's Passion. Moreover, so many other functions took place on this day that the principal event was almost lost sight of. This is mentioned as the chief reason for the introduction of the new feast, in the Bull "Transiturus." As a movable feast, Corpus Christi has some connection to Easter in the church calendar. But what is the connection? It makes sense to celebrate on a Thursday, the traditional day of the week of the Last Supper. But why celebrate the Thursday after Trinity? When the feast was established in 1264, the feast of Pentecost had an octave1 and effectively lasted a week, up to Trinity Sunday. This meant that the first "unimpeded" Thursday following Maundy Thursday was the Thursday after Trinity — the season of Easter impeded2 all the Thursdays up to Pentecost, which had its own octave covering the Thursday after that. 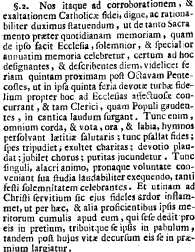 My Latin isn't really up to it, but I can see that he specifies "the fifth day next after the octave of Pentecost, that is the fifth day of the week" which is the Thursday after Trinity (Sunday is the first day of the week). A better translation would be greatly appreciated. The last clause at least is a bit iffy. 1 Octave: A period of extending a feast-day over the following week, making eight days in total. See the Wikipedia article. Pentecost is slightly unusual as its Octave does not include the following Sunday. That Sunday is a feast of its own, Trinity Sunday. Not the answer you're looking for? Browse other questions tagged catholicism communion holidays or ask your own question. Is the feast of 1 Corinthians 5:8 the same feast as 1 Cor 11? Into what eschatological category do the teachings of the Catholic Church fit?